Valentine's Day is coming up in a week so I wanted to share my sweet little gifts to my boyfriend because we won't be able to spend the holiday together since he is away on a work trip. Yes, I know many object to this sexist consumer-driven day but I like to make the best of it and show you how I'm doing it my way! I discovered MeUndies when I met my boyfriend, as he is a big fan of the fit and fabric. The company offers a subscription service so you can save per pair which is delivered each month, and I've been tempted when I saw his packages arrive. 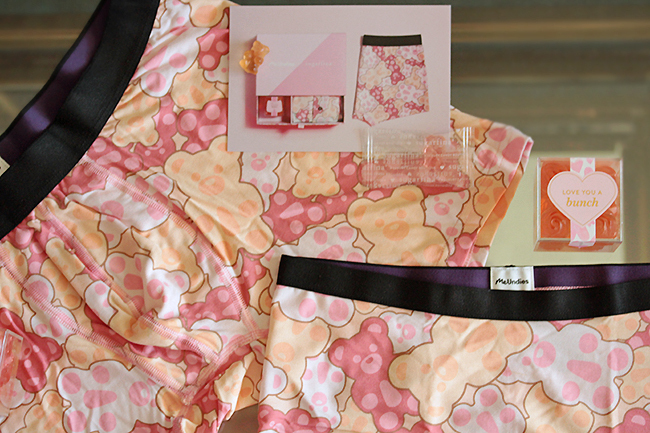 I personally enjoy variety in my undergarments and would rather wait for promo codes and purchase occasionally when I see a design I like — which brings me precisely to the reason why I decided to write this post! 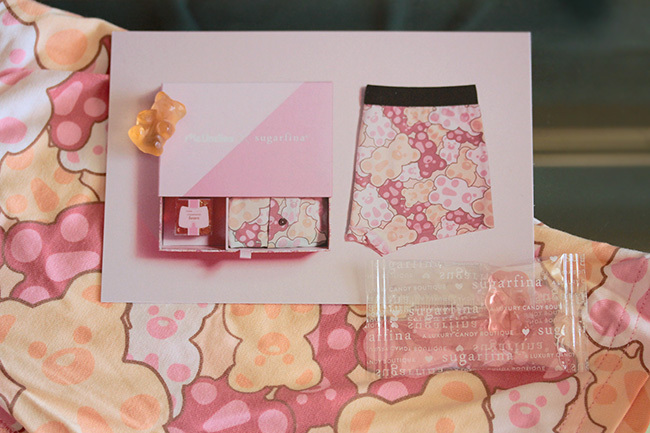 Sugarfina, a luxury candy boutique famed for their yummy champagne and rosé gummy bears, collaborated with MeUndies for this super sweet collection for Valentine's Day. I had introduced my boyfriend and his family to Sugarfina over Christmas so I couldn't resist splurging, even though the women's Rosé Bears print was sold out in everything except the boyshort. The fabrics are so silky soft, no chafing or rubbing or rolling up during my work outs, and they actually hold up well to washing and drying. I recommend washing in cold water and hang drying to preserve the colors! As much as the Rosé Bears would be most natural fit for Sugarfina's signature print, my favorite is the black, white, red and pink Heart Party pattern. It is quite appropriate for Valentine's Day but I think it's wearable throughout the year due to the pop art styling with black trim. I only used to wear Hanky Panky, but because of my affinity for leggings I prefer seamless underwear nowadays. My boyfriend is dedicated to the boxer brief, and I wear the thong in size S but I was surprised to find the cheeky brief in XS the most comfortable. Along the lines of practical gifts like underwear are books, which is why I would love if my boyfriend would read one of my favorites. Most of our lives are so busy that we hardly take the time to read any more, but that's why I treat myself to hardcover books when I can. "The Subtle Art of Not Giving a F*ck" is an important and refreshing reminder (written by a blogger, no less) for us to make the time and effort to prioritize on what matters to us — to not care so much or get hopelessly wrapped up in other people's opinions and judgments. Be good and do right by the people you love and chase your dreams together!